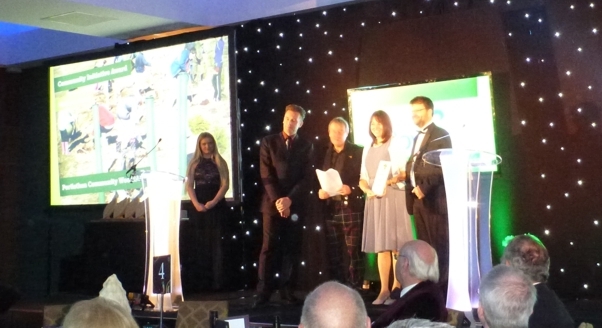 The third annual RSPB Nature of Scotland Awards held at the Sheraton Grand Hotel in Edinburgh on 20th November was hosted by author, naturalist and TV presenter Chris Packham where GreenPower was delighted to sponsor the Community Initiative Award. Phil Parkin, one of the Directors of GreenPower, said “GreenPower are delighted to sponsor the Community Initiative Award for 2014. GreenPower are an independent renewable energy developer, based in Alloa in central Scotland. During development activities we often have to deal with complex and challenging environmental issues and we readily recognise and appreciate the hard work and commitment to nature conservation shown by those involved in each of the projects that have been nominated for this award”. The nominations were Porthlethan Community Woodland which was highly commended, The Green Team based in Edinburgh, the Volunteer River Regeneration Project located in Central Scotland and the Woodside Wildlife Garden located in the Scottish Borders. The winner of the Community Initiative Award, sponsored by GreenPower, was the Volunteer River Regeneration Project and a trophy was presented to the winners by GreenPower director John Morgan: “Once again I found this a truly inspiring evening with people passionate about the natural environment and wanting to encourage others to get involved in nothing less than the stewardship of the planet. GreenPower is proud and honoured to present the Volunteer River Regeneration Project with the Community Initiative Award.”The Volunteer River Regeneration Project was established in 2010 by a group of volunteers in order to regenerate a river. An action plan was created following consultation with sixteen communities and with enhancement works including paths and bridges, the river is now an integral part of the Central Scotland Green Network.